Do you like popcorn? Do you like candy? Have you thought about trying to combine the two? If so, then a popcorn ball may be for you. Online, there are many recipes. I decided to compared these three recipes. I thought that all of the recipes were good, but I thought that the Martha Stewart one was the best of the three. I thought that the Food Network one was simple, but it was just missing something. I thought that the Karo Syrup one was good too, but it was not my favorite. Stir in vanilla. Pour over popped corn, tossing gently to coat. 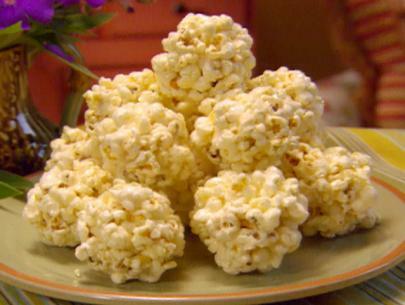 When mixture is cool enough to handle, press popcorn into 3-inch balls with lightly greased hands. Cool completely on waxed paper. Melt butter in a large heavy pot over low heat. Add marshmallows and brown sugar and stir until melted. Remove from heat. Pour popcorn and cranberries, or English toffee bits if using, into pot; toss well. With buttered hands, shape into 2 1/2-inch balls. Set on parchment lined baking sheet to dry slightly. Combine sugar, corn syrup, butter and salt in a heavy 2-quart saucepan. Stirring constantly, bring to boil over medium heat. Continue stirring and boil 2 minutes. Remove syrup mixture from heat; stir in vanilla and baking soda. Pour syrup mixture over warm popcorn stirring to coat well. Cover hands with two plastic bags, spray bags lightly with cooking spray. Working quickly shape twelve 3-inch popcorn balls. Cool completely. Wrap individually in plastic wrap.